“If Arkansas ever had an honest-to-God hero, ‘Footsie’ Britt was that person,” proclaimed Lt. Gov. Mike Huckabee soon after learning of the Carlisle native’s passing on Nov. 26, 1995. It would be an unusual Arkansan who found reason to disagree. “The Natural State” has produced dozens of noteworthy citizens, but none more gallant, accomplished and admirable than the man who came to be known by his size 13.5 shoe size. His imprint was first discernible at Lonoke High School, where his excellence as a three-sport athlete and an essayist passionate about patriotism earned him statewide respect. 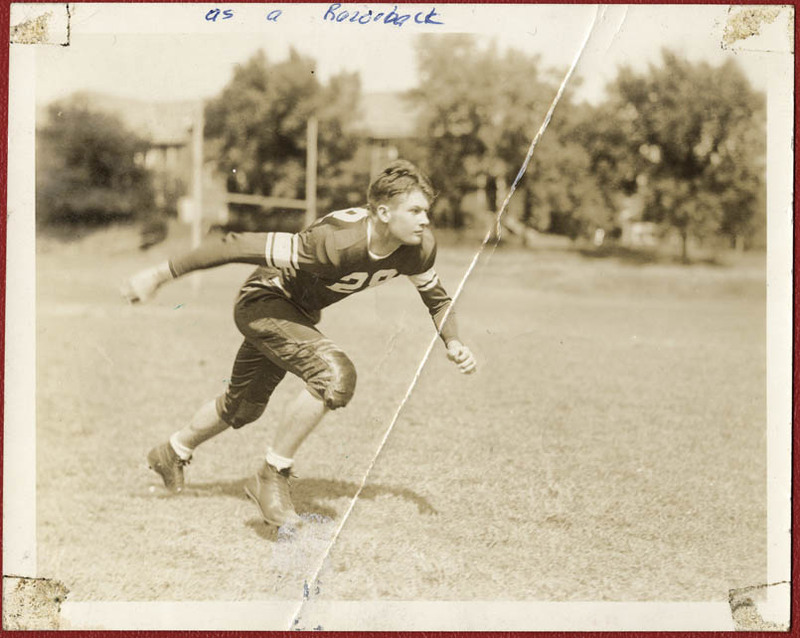 Graduating in June 1937 while serving as both class president and class valedictorian, he accepted a football scholarship at the University of Arkansas, simultaneously qualifying for a four-year appointment in the school’s ROTC program. In Fayetteville, he again lettered in three sports — football, basketball and track — claiming All-American Honorable Mention gridiron honors in both of his last two seasons. Dec. 7, 1941, and the Japanese bombing of Pearl Harbor brought an abrupt and premature close to what promised to be a multi-year career as an end with the National Football League’s Detroit Lions. Within weeks of the “date that shall live in infamy,” “Footsie” entered the United States Infantry as a Second Lieutenant, and before wounds at the Battle of Anzio, Italy, on Jan. 23, 1944, hospitalized him, he compiled one of World War II’s most meritorious military records. The young man with oratorical eloquence when treating patriotism proved that, for him, the topic merited much more than inspiring words; losing his right arm and a portion of his right leg to enemy fire, he demonstrated that it deserved the most courageous, the most selfless actions he could summon. Three nations, Britain and Italy in addition to the United States, provided “Footsie” with their highest honors. From his grateful nation came the Purple Heart, with three clusters, and a battlefield promotion to Captain, as well as its four best-respected, most-prized medals: the Congressional Medal of Honor, the Silver Star, the Distinguished Service Cross and the Bronze Star. He emerged a national hero, the first American soldier of World War II to win all of the Army’s top medals for valor. “Footsie” did not seek a third term. Soon thereafter, President Richard Nixon named him district director of the federal Small Business Administration, a post from which he retired in 1985. A year later, he made his final foray into politics, failing in his bid to gain the Republican nomination for governor. A decade of comfortable retirement followed, frequently punctuated by fishing trips to his beloved Lonoke County. He remained a revered figure throughout the state, distinctive because of his 6-foot-4 height and unmistakable because of the empty, motionless right sleeve neatly tucked into his lower-right jacket pocket. With the passing of the Colors, his left-hand and -arm salutes to “Old Glory” would snap into place, silent signals of his undiminished love for America. For six hours on Nov. 30, 1995, a scene impossible to replicate honored “Footsie” in death. Hundreds of admirers, many of them not alive when he amazed and inspired the nation with his heroics, filed by his open casket in the Capitol Rotunda. His military jacket hung from the back of his favorite rocking chair, which was placed next to his body. His medals and cap lay on a nearby table, and an Army Sergeant stood at the head of the casket throughout the six hours.